A check valve installed in a natural-gas well bore to shut off gas flow while replacing the blowout preventer (used during drilling) with a christmas tree piping arrangement, which controls gas flow out of the completed well. An automatic valve which permits liquid to flow in only one direction. 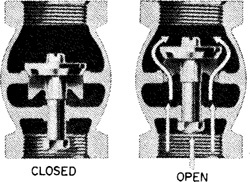 Also see non-return valve.